laser - Michael P. O'Neil, D.D.S. Dr. Mike O’Neil has been extensively trained in laser use by the Academy of Laser Dentistry. A new and wonderful era in dentistry has begun. Dr. Mike O’Neil is pleased to offer this state-of-the-art technology to his patients right in Fishers, Indiana. Laser dentistry is one of the most cutting edge techniques to come to dentistry in the last five decades. 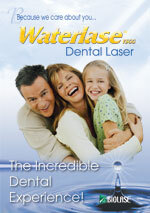 The Waterlase, by Biolase, is an all-purpose laser. It is simple in its design, but extremely versatile in use. It can be used on both soft (gum) and hard (teeth and bone) tissue with substantially less postoperative discomfort than conventional dental techniques. The use of local anesthetics can be omitted all together in some procedures that would normally require some type of anesthetic. Our Diagnodent Laser allows Dr. Mike O’Neil and the hygienists at Today’s Dentistry to diagnose decay BEFORE it can be seen clinically or even on an X-ray. When the use of the Diagnodent Laser is combined with the Waterlase, a patient can be assured of the smallest filling possible. These state-of-the-art machines assure the most conservative approach. an instrument that sterilizes as it heals…..THAT IS WHAT LASERS DO!!!! All of this is routine here at Today’s Dentistry and offered to our patients daily!